Invaluablist | "Universal Principles of Design"
An invaluable book for anyone doing anything creative. Any creative person would appreciate this comprehensive design primer: Universal Principles of Design. As would those who are aesthetically aware but perhaps do not participate in creative pursuits themselves. In other words, this book is well-suited not only for artists but for patrons of the arts as well. Finally, those who appreciate functionality in systems and processes will likely also enjoy it. 100 ways to Enhance Usability, Influence Perception, Increase Appeal, Make Better Design Decisions, and Teach through Design. The handsome book features many informative illustrations. One would expect a book about design to exhibit thoughtful conception, and this one certainly does. Importantly, the content is not limited to graphic design. Anyone organizing information—even just written information—would profit from exposure to these universal design principles. And for just two examples of subjects within that lie beyond the scope of graphic arts specifically, Universal Principles of Design touches on effective man-machine interfaces and engineering for safety. It is these areas that fall squarely in the realm of invaluability; bad design can lead to catastrophe, whereas good design can avoid it. A comprehensive primer on useful and appealing design. Great for creatives and creative-appreciators. Not only professionals, but hobbyists too would profit from exposure to these universal principles. Among numerous others, the amateur photographer, crafter, landscaper, interior decorator, picture hanger, and even closet organizer would all be served well to learn many of the design tenets explained. Aesthetic designs look easier to use and have a higher probability of being used, whether or not they actually are easier to use. More usable but less-aesthetic designs may suffer a lack of acceptance that renders issues of usability moot. 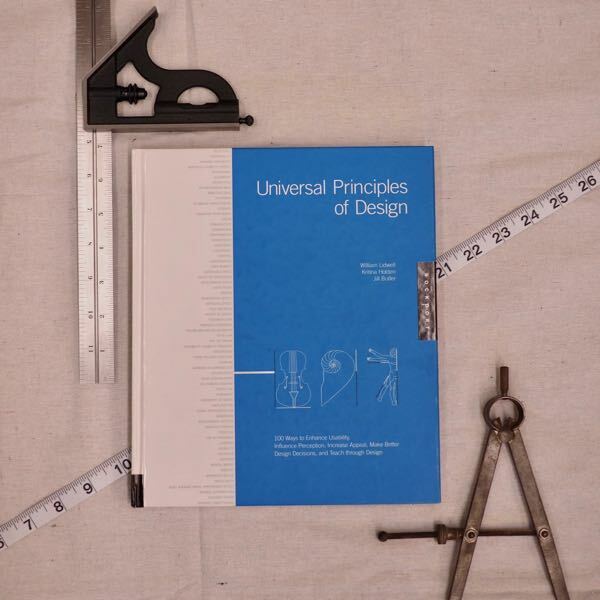 Universal Principles of Design is a terrific and invaluable gift consideration for all sorts of gift recipients. And it certainly should not be pigeon-holed for only creative-oriented people. It would be great for persons studying art, engineering, architecture, photography, computer coding, landscaping, and, well, again, anyone doing anything creative. This book would be great for people interested in home crafts as well. Finally, the original hardcover version of this book is an especially good coffee table or guest room library specimen (if you can find a copy of the original hard-bound edition, grab it).